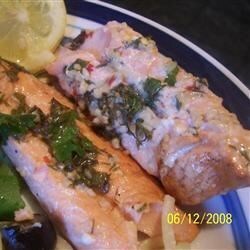 "This is a great, simple summer fish recipe for people who have never grilled fish before!" Lie the salmon in the bottom of a baking dish. Whisk together the lemon juice, wine, mint, dill, parsley, garlic, and red pepper flakes in a bowl. Slowly drizzle in the olive oil while whisking vigorously. Pour the mixture over the salmon. Marinate the salmon in the refrigerator for no more than 30 minutes. Thread the salmon onto metal or soaked wooden skewers lengthwise. Cook on preheated grill until opaque in the center, about 4 minutes per side. Serve immediately. Pretty good, however we didn't enjoy the mint. Next time I'll make it without the mint and use more dill. Loved the combination of flavors! Great flavor....(and a month later after being frozen)..it was even better.